Samphire Restaurant at The Waterside House Hotel is fast making a name for it's Culinary delights. With Executive Head Chef Tom Walsh at the helm, it is delivering a menu with dishes that looks like something lovingly crafted in a Michelin Star Kitchen. With great combination of flavours , textures and plenty of flair, this is more than just a meal but rather a unique dining experience . Nestled in the seaside village of Donabate, a mere 20 mins on the north side of Dublin, it is right on the beach and offers spectacular views over Dublin bay and Lambay island. Weather permitting, you could enjoy an Aperitif on the terrace that overlooks the beach and the Martelo tower. You will be greeted with a warm welcome,the staff were courteous, friendly and polite throughout the evening. Their new menu has embraced the autumnal season in full sails, Spiced pumpkin soup &Seared Scallop, Oysters, a varied selection of Game dishes across Starters and Mains, from Quail Salad,Crisp Quail eggs & Micro veg or Breast of Wood pigeon, Spinach & Crisp Salsify or Guinea Fowl, Foie gras, Albuferia Sauce to Venison. We kicked off our meal with a Mackerel Sashimi &Tartar, Lemon cream and Apple. 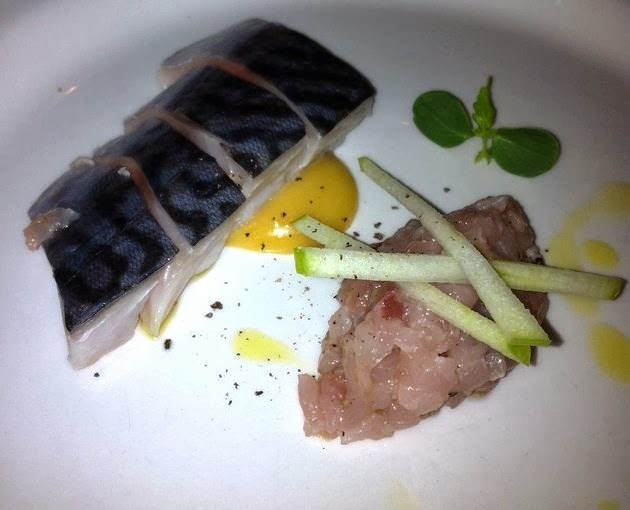 Both version of the Mackerel were succulently good, While the sashimi was fresh and zingy, the tartar was soft and savoury. The lemon cream and sour apple complimented the raw fish to perfection. It was wonderfully well thought out and even better to taste. 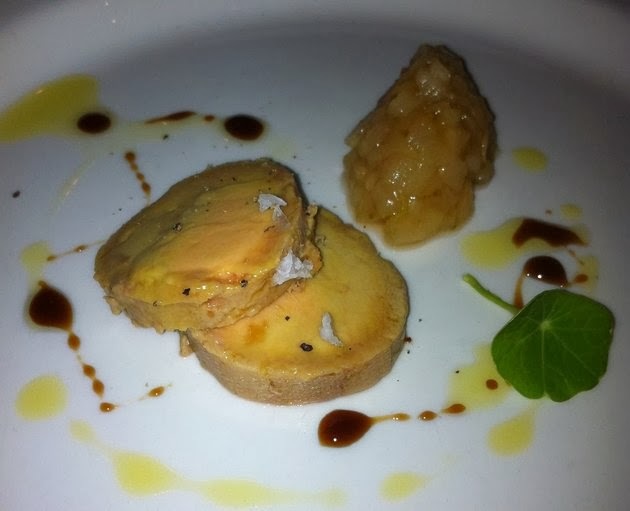 Saucisson of Duck Foie Gras. Pear &Lime chutney was so silky, they seemed quite literally and in the approved manner to melt in the mouth and the equally delicate Chutney did indeed bring not only fruity flavours but muted the buttery smoothness of the foie gras . Spiced Pumpkin Soup & Seared Scallop was another winner . 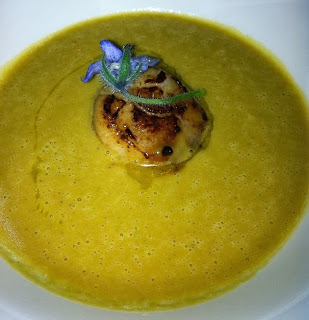 I really love the combination of roasted pumpkin and the seared scallop and I can still recall the rich deep taste and addictive nature of this dish. It was beautifully velvety and packed to the rafters with autumnal flavours. A Sweet Potato Risotto & Potato mousse was a bit disappointing . 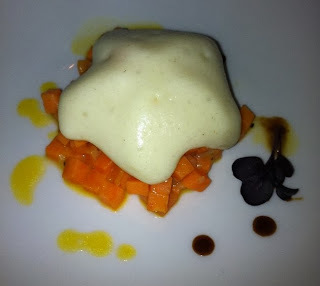 While the potato mousse was light and creamy and the brunoise of sweet potato perfectly cooked, I felt there was something missing in this dish,in order to elevate it to the same level,as the three previous dishes we just consumed . 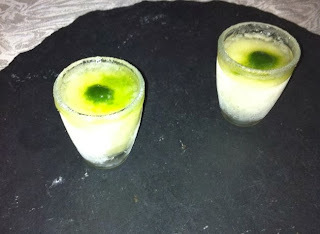 Before moving on to our mains, a palate cleanser of Mojito Sorbet, was very good and an ideal entre-mets served in chilled & quirky shot glasses with mint essence. 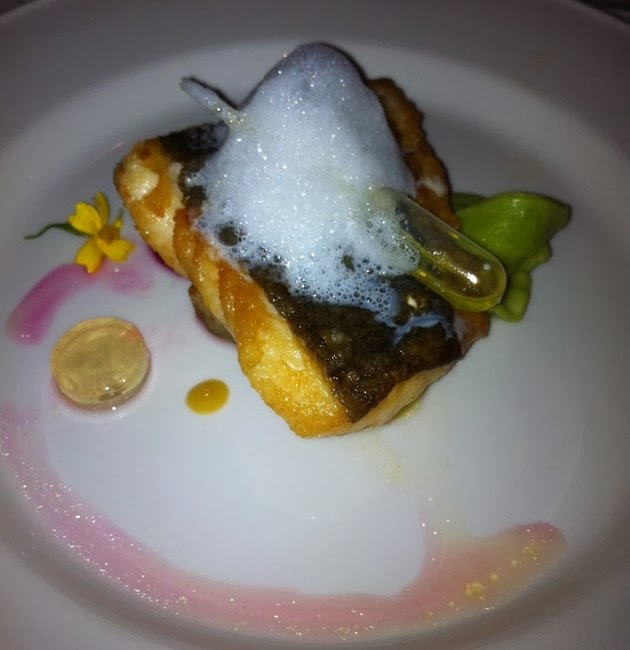 Our mains of Seared Turbot, Artichoke,Crab tortellini, Lemon truffle foam was utterly stunning.Beautifully cooked with crisp skin, the flesh was moist and fell apart at the touch of ones fork. A beetroot puree added a touch of sweetness to this delicate dish . Lamb Noisette, Chicken&Truffle mousse, Micro vegetables and Squash jelly was a more down to earth affair . The lamb was very tender and coated with a light Chicken and truffle mousse. 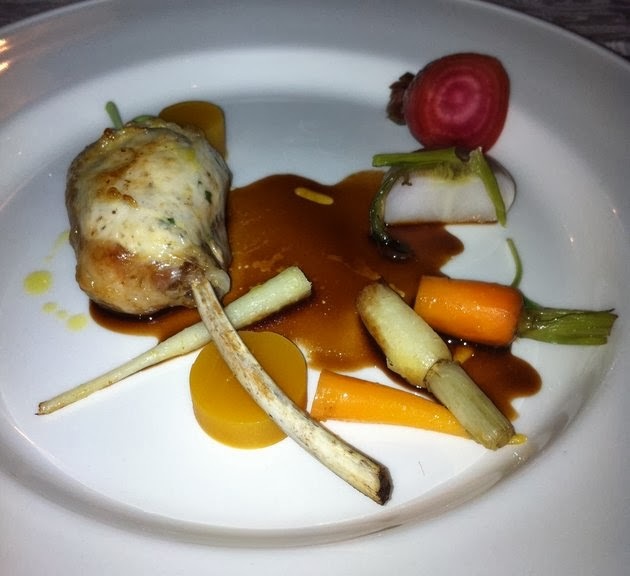 A selection of baby root vegetables and Madeira jus made this a delicious dish . 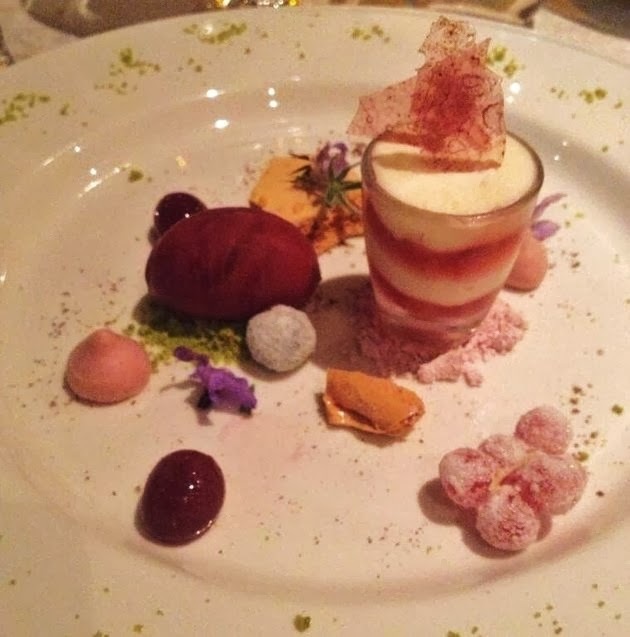 Textures of the Forest was a magnificent creation of Raspberry cheese cake, Sorbet, Honeycomb, Frosted berries, Raspberry pops& tuile, Strawberry meringue and Pistachio crumbs. It was an amalgam of textures with perfectly paired flavours and plenty of flair . All devine . A Poached Pear, Pear and Walnut pureé,Spiced crumbs & ice cream was to die for . The pear was beautifully poached, with still a bite to it. 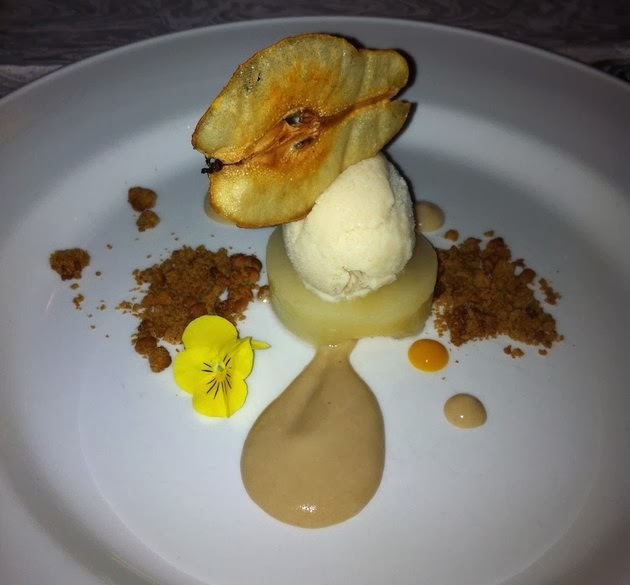 It was served chilled , along with the ice cream and spiced fruit pureé, it was a sumptuous end to a satisfying meal . Once again Chef Tom Walsh, didn't disappoint . I love his cuisine and would gladly eat his food every day . Do check my previous post " The New Age Of Irish Chefs " Part 3.. Tom Walsh, http://jacobcrackers.blogspot.ie/2013/10/new-age-of-irish-chefs-part-3-tom-walsh.html for a review of his other Culinary delights.